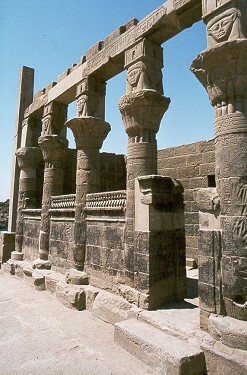 In Egyptian architecture the term used for a block of stone spanning the width between two columns or pillars and supporting the roofing slabs. Architraves are usually attached to each other and to the abacus of the column by means of pegs or dovetails. The undersurface and the sides often bear bands of text. Architraves are sometimes constructed of two parallel blocks, a device designed solely to simplify the construction work. In the pyramids of Senwosret III and Amenemhat III at Dahshour hollow ones were used to reduce the weight. In general, wooden architraves were only used for constructions of wood or lighter stone, whereas architraves of granite, sandstone, and limestone were employed in stone buildings.